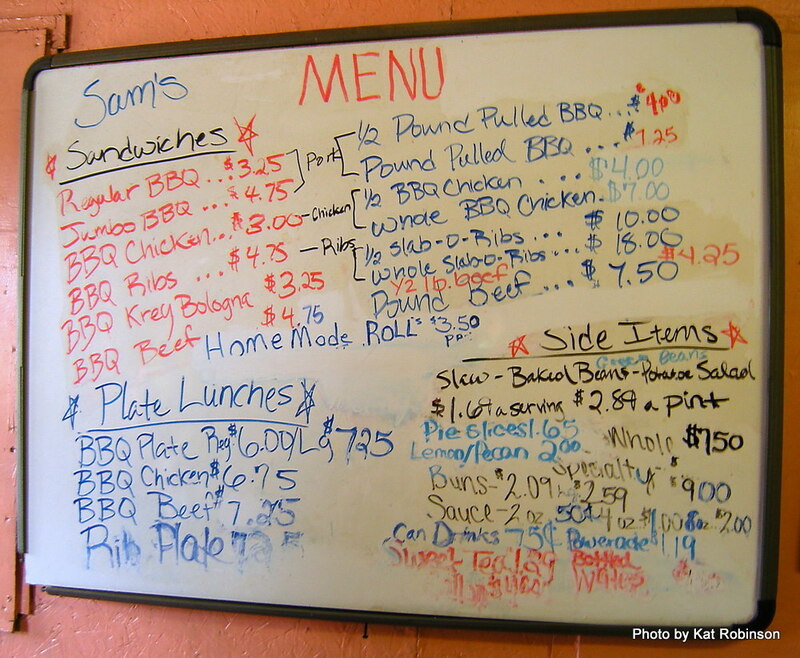 How do you know the really good barbecue joints? Well, it’s like counting rings on a tree. 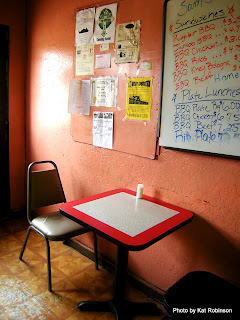 If a place shows its age, has been around and looks like hell, chances are it’s pretty good. And then there’s the scent of smoke in the air, of course. Maybe there’s a corollary between good barbecue and bad architecture. Who knows? Traci, my traveling companion of the day, was taking me across a portion of western Tennessee to hound out some story ideas. 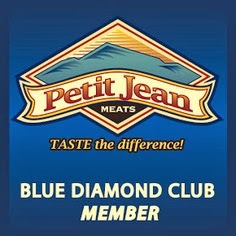 We were on our way to Humboldt and scouting out a good place to have lunch once we were done with our business there. We’d already passed through Belz and the pickings had looked slim. 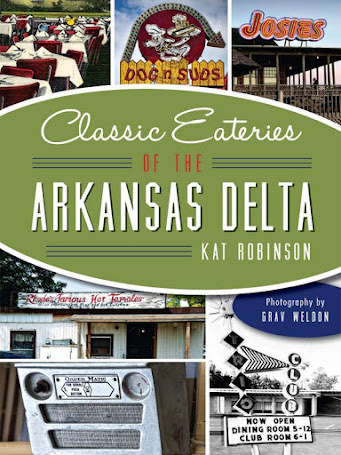 A scattering of closed businesses and convenience stores had been the only signs of consumables on the road since, and we were chatting about how good barbecue restaurants usually look pretty ragged. And sure enough there was, a plume of smoke from a chimney on the back side of the lean-to, a little building pressed up against that boarded building with a sign out front that said Sam‘s Bar-B-Q. “That might be some of the best barbecue we’ve ever tried,” I told her. Since we were running early, we rolled around town a bit. Saw a place right up the road called Armour BBQ, and there was a little ribs-and-catfish place downtown. 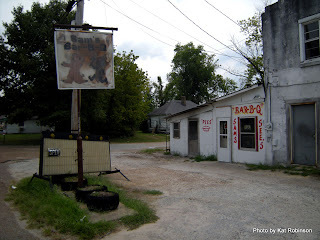 We took Highway 79 on to the north past downtown and saw a place called Sip of Suds, which we both instantly thought must be a Laundromat but which turned out to be a bar. There were a lot of grills -- Humboldt Grill, T-Baby’s Bar and Grill, the East End Grill. But nothing really caught our fancy. 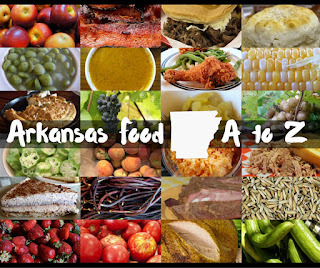 We ended up asking folks at the West Tennessee Regional Arts Center about their selections for restaurants in the area. Outright, I asked Bill Hickerson with the Center what he thought about Sam’s. “It’s barbecue. It’s good,” was his response. Not much more. Apparently the only real way to get the real story on Sam’s was to stop in. So back down Highway 79 we went, a little apprehensive but very hungry. The sign in the window had been turned around to “OPEN” and there was a screen door on the other side of the main entrance open and fragrant with smoke. Inside a single wall unit air conditioner was fighting for its life against the heat of the day, a sole ceiling fan giving it just enough oomph to spread a little bit of coolness around the room. And what a tiny room it was. The entire space wasn’t much larger than my bedroom at home. 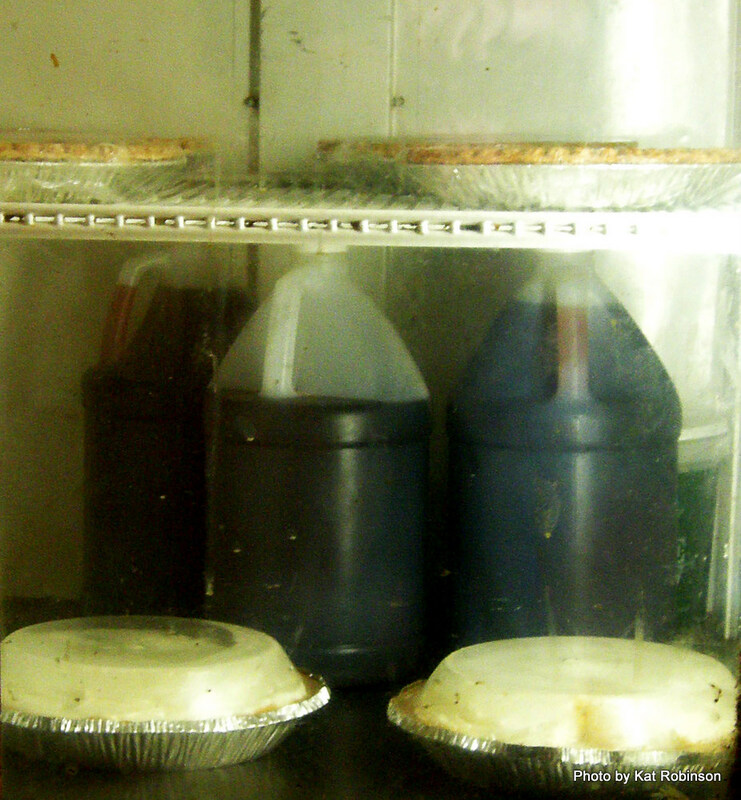 A counter and register divided the area in two; on the road side, two tables and five chairs shared space with a bun rack and a refrigerated drink and pie cooler. On the other, a refrigerator hunched under a big fan. There were two commercial sinks improbably shoved in the back and a single white home-style oven crowded in, its top laden with pies of several sorts. There was a large woman behind the register who welcomed us when we came in and asked us what we wanted. 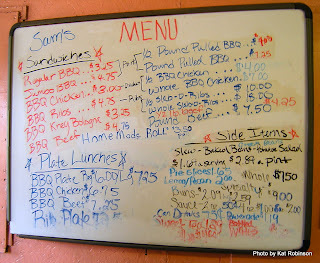 There was no printed menu, just a wipeboard that had been wiped and reused over and over again. Traci and I counted up the cash we had; this was obviously a place that didn’t accept plastic. She had eight bucks; I had about $15 of quarters in a pouch, a practical joke from my husband who decided he’d more than literally follow directions. “It’s all good, all good,” she told us. I looked over the board, mindful of what we had left to spend. I wasn’t all that concerned about sides like “potatoe” salad or slaw or beans that were $1.69 a “surving.” I just wanted to try some meat and sauce and see if it was any good. 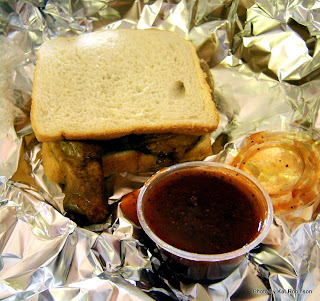 The chicken sandwich at $3 seemed like a no-brainer, and Traci and I decided to split one along with a BBQ beef sandwich. 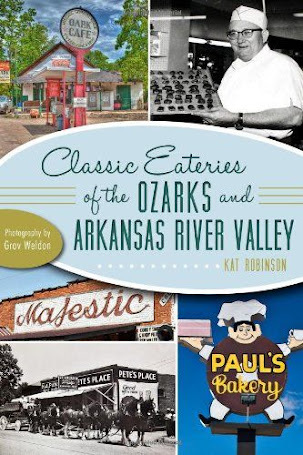 Other items caught my eye, but I held back -- on things like Homemade Rolls for $3.50 a pan and the BBQ Krey Bologna (Krey is apparently the West Tennessee answer to Petit Jean Meats). We had a seat at one of the two little tables while the lady went into the back and got our stuff together. She did pull out a plastic container from the refrigerator before she walked back there, telling us she’d have to reheat the beef. That was fine with us. A blue collar guy came in and stood at the counter, waiting for our hostess to come back. He told us he’d been coming there as long as he could remember, but he couldn’t pin a date on the origin of the place. Another guy, an older man, also came in and started telling us that this was Sam’s but it wasn’t -- that the original Sam was in an assisted living facility, and that even the original Sam wasn’t the original guy on the sign. I had to go back later and do research, and I found a few things out. 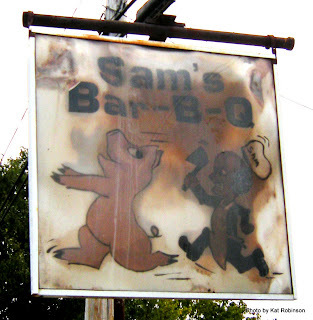 See, Sam’s Bar-B-Q started off as something else back in time lost. Sam Donald -- that’s the Sam the business is named for -- retired from the local arsenal in 1965 and went to work for his brother-in-law’s barbecue joint downtown. And over that time he learned how to make the sauce and such. He worked the concrete pits there at the old place. The old place closed down, and people pressured Sam to get his own place going. 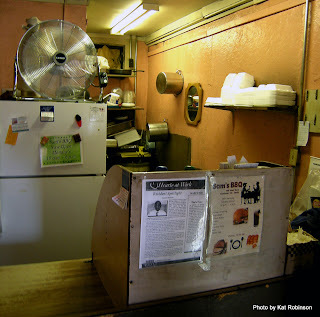 So he started Sam’s Bar-B-Q in 1988. And for years it was just him and his wife, making not much more than smoked pulled pork shoulders, smoking them over hickory and oak. 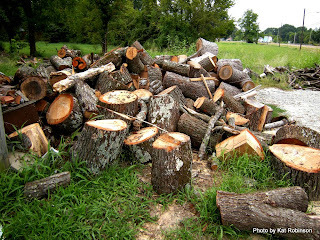 He was a big proponent of wood smoke for barbecue. In 2007 Sam finally retired at the ripe old age of 87. 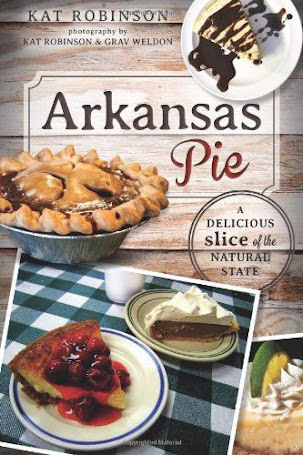 He handed down the business to his son-in-law John, who also goes by the name “Sam.” John (we’ll refer to him this way just to eliminate the confusion) has added a few menu items like those homemade rolls and sides and pies that he makes himself. We didn’t get to meet John while we weren’t there, but we did have a pretty good idea of what sort of history went into this place. 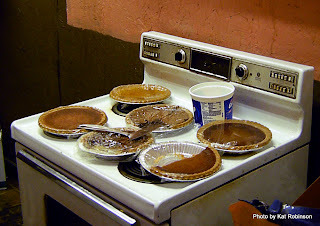 “Kat, I saw you eyeballing that pie,” Traci goaded me. “What sorts do you have?” Traci asked. “Fair enough.” I dug around for more change and handed it to Traci, who handed it over to our cashier. Traci came and sat down and we negotiated the bags between us. 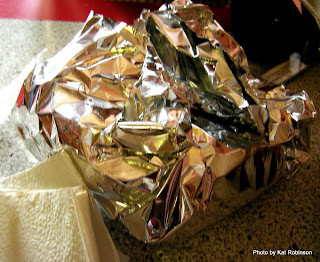 The tiny tabletop wasn’t much for holding what we had, but we pulled out the aluminum foil wrapped sandwiches and sauce cups and sat our bags on the floor. I’ve been surprised by many things in this job, but I can honestly say I’d never seen the sight that greeted me. 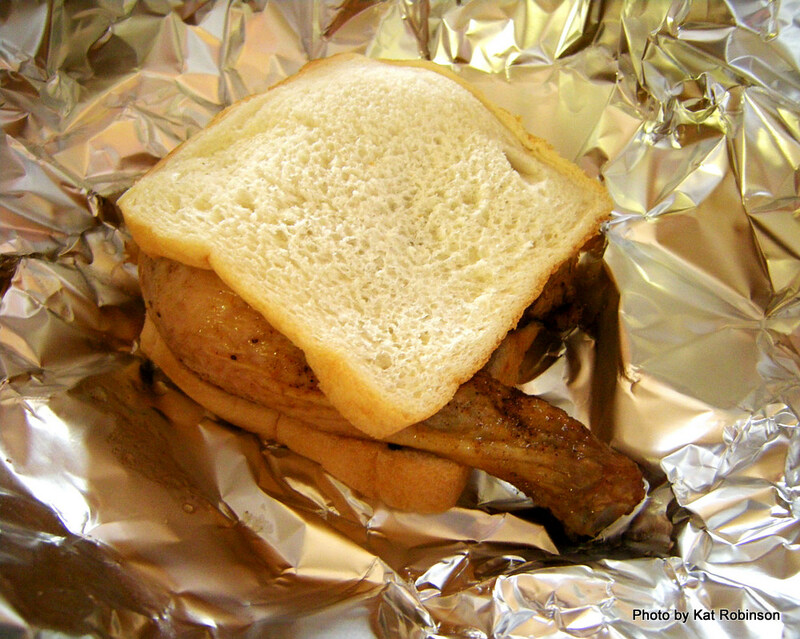 I opened the aluminum foil wrapped pouch and was greeted with the sight of a naked smoked chicken leg quarter sandwiched between two slices of white bread. For a moment, I just looked. Then I pointed it out to Traci, and we both laughed at it. Well, that wasn’t going to do. I lifted the bread off the top and tugged a little at the leg bone -- and all three of the bones in the quarter just came out. It was as if I had pulled a loose seam and all the stuffing had come out. I was left with a messy pile of pink smoked chicken inside a little skin on that slice of bread. I managed to get it up under the bread and dab a little sauce on it before I cut it off and slid half over to Traci. 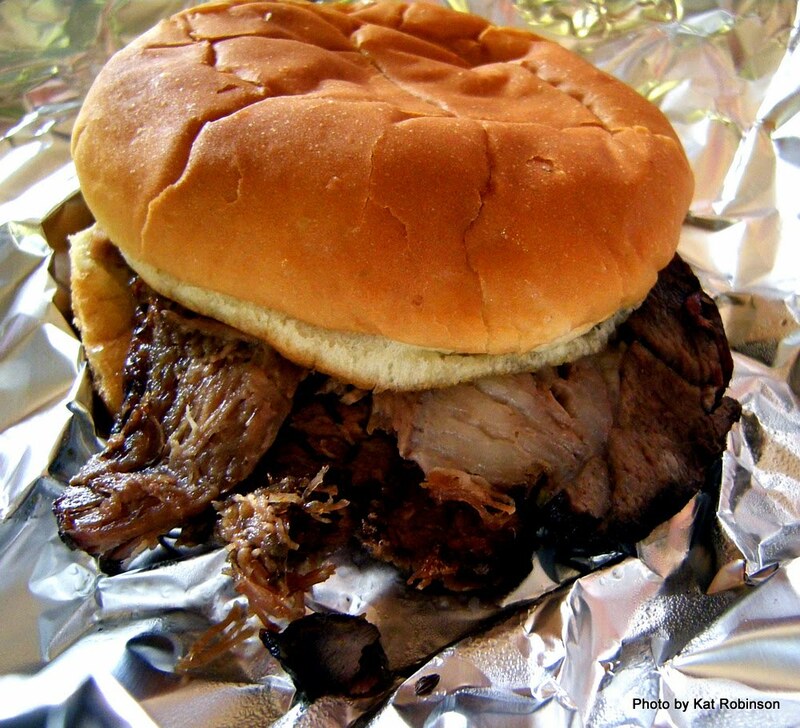 The barbecue beef she’d opened was a big wet pile of thick cut and sliced brisket, with plenty of visible marbling. It was served up on a big yellow bun and looked like a cardiologist’s nightmare. 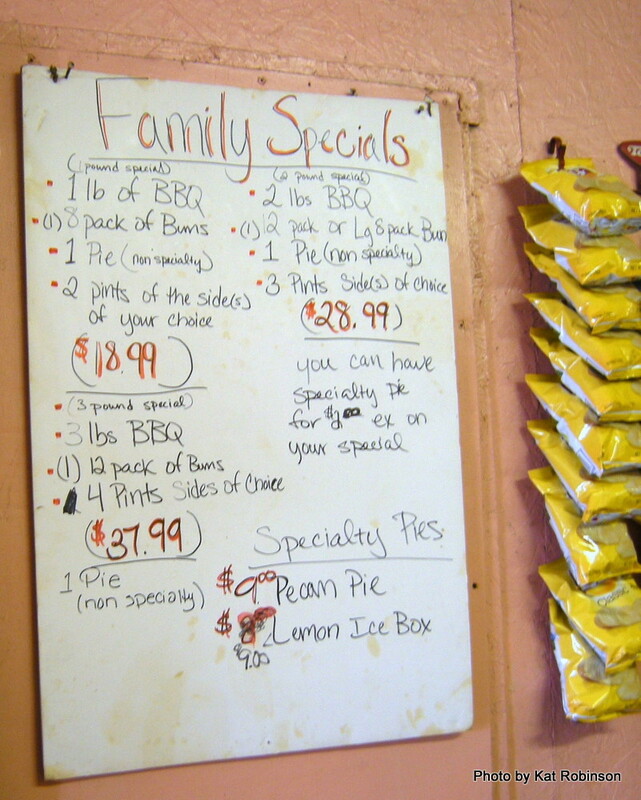 Or, as I’d put it, damn good barbecue. I started out on that chicken sandwich, having to grasp it back deep into my palm and hold it together with my fingers to keep the sandwich integrity going. And let me tell you what -- that has to be the most tender chicken I have ever sampled. It was smoky and pink and slightly salty, it held its own against the sauce and it dampened the white bread considerably. It was the sort of sandwich best eaten over the sink, but it was mighty fine. 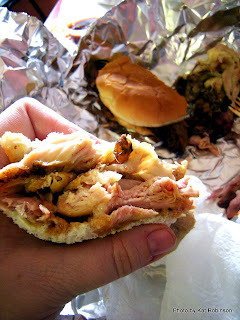 I can see how someone might pick up one of these sandwiches and take it for lunch on a jobsite, how they could flick out those bones with one pull and a flick of the wrist and wrap that sandwich up tight in the foil for less messy eating. It may be the best barbecue chicken I ever had. Part of that was the sauce, which was a vinegar based sauce heavy on the black pepper and clouded with a whole lot of other spices. There wasn’t any sweetness to it, just the tang and the bit of heat from that pepper and not much else. But it was the perfect sauce for that hickory wood smoker. It made the white bread taste sweet and the chicken taste meatier. And of course, there was that beef sandwich. We had swapped halves and once I finally made it through the chicken sandwich I had my side of the brisket, moist and smoky and it just fell apart in my mouth. None of this dry Texas style beef brisket or the coarsely veined slices you get from Corky’s or the other Memphis barbecue places. This is how I have brisket when I make it -- smoked so long on such a well-marbled cut of meat that it literally dissolves on the tongue. It was very wet, though, but that bun did what it needed to do to keep the barbecue together. Our hostess handed over that slice of Chocolate Chess Pie in a Styrofoam container. We took our little plastic forks and dug into it -- after photos, of course. 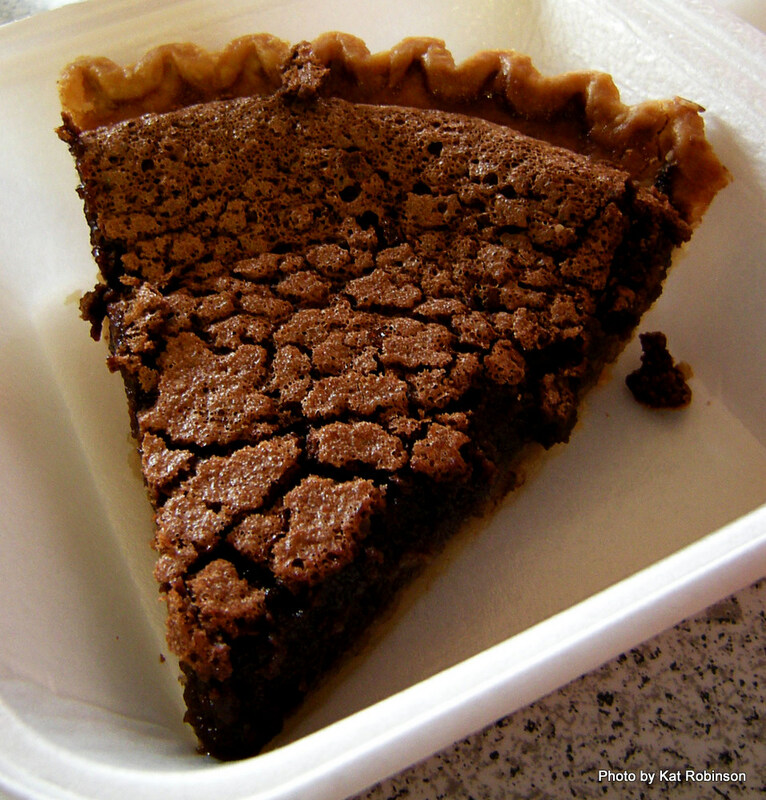 I like my Chess Pie, and I even like it when it’s adulterated a little with something else. This was good. It was the consistency I expected from Chess Pie but with a brownie-type crust that had formed on top, the center ooey soft, all poured into an apparently storebought crust. I could forgive that -- I mean, if one man’s in charge of barbecue, rolls, sides and pie, I can give him a little slack. We had places to go and things to do -- our next stop was the Alex Haley home in Henning, a good bit of a drive from Humboldt. So we had to go. But that’s fine. I think I will be making a special trip back at some point to get me some more of that. I want to try one of those whole smoked chickens for $7. I want to see if the chicken falls off the carcass like it did off that leg quarter. 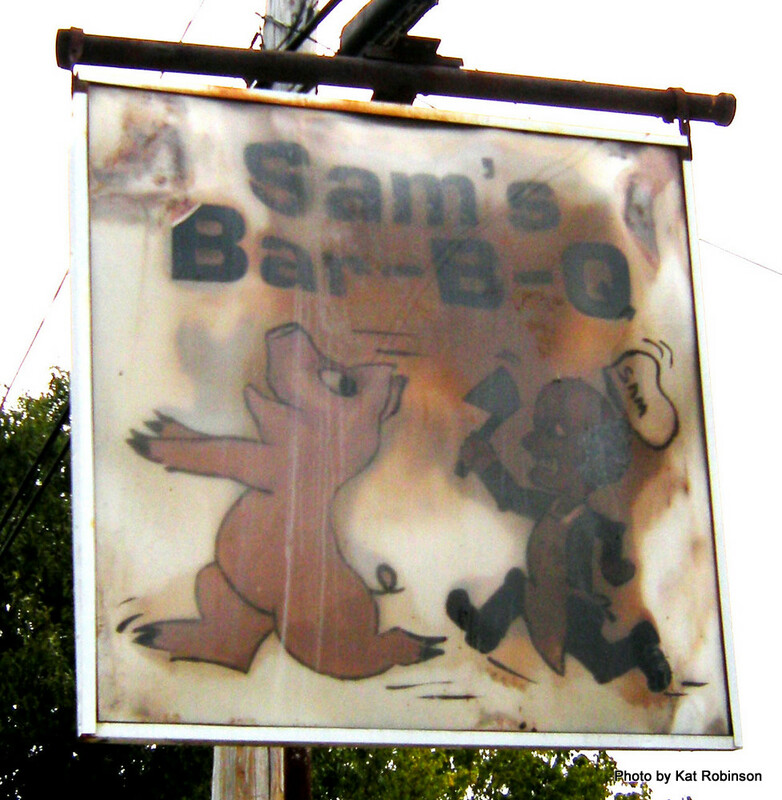 You too can find Sam’s Bar-B-Que. Take Highway 79 up from the interstate at Brownsville -- it’s on the right as you enter Humboldt. The restaurant is open from ten to six every day except Sunday, when it’s open from noon until four. I bet they’d take a phone order, too -- (731) 784-9850. And chances are this is as close as you’re going to get to a business website. 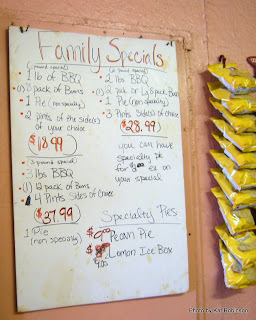 I do miss Arkansas and Tennessee BBQ. So, we just did it ourselves recently. It was fantastic. Brisket and longaniza sausages.